رنجبر سعادت آبادی, عباس, سوری, معصومه. (1396). مطالعه بی‌هنجاری گردش‌های جوی همراه شده با فعالیت نوسان مادن-جولین و بارش زمستانه ایران. مجله ژئوفیزیک ایران, 11(1), 49-65. عباس رنجبر سعادت آبادی; معصومه سوری. "مطالعه بی‌هنجاری گردش‌های جوی همراه شده با فعالیت نوسان مادن-جولین و بارش زمستانه ایران". 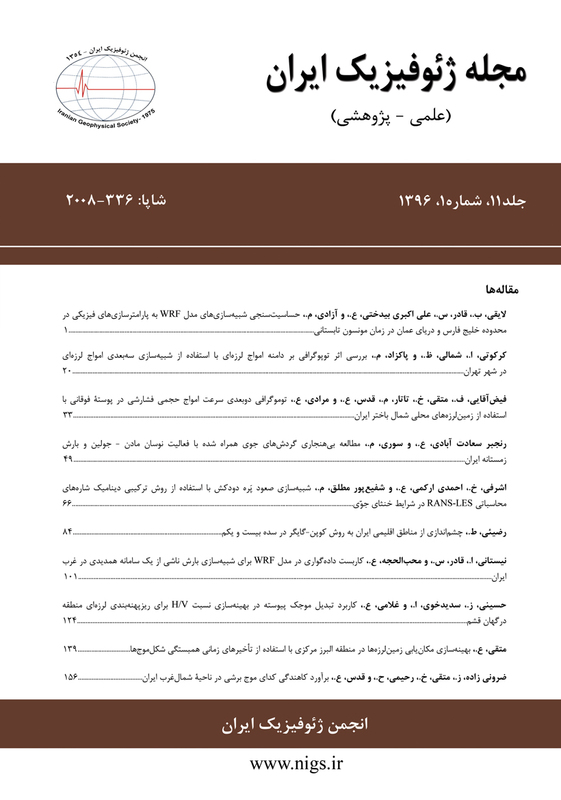 مجله ژئوفیزیک ایران, 11, 1, 1396, 49-65. رنجبر سعادت آبادی, عباس, سوری, معصومه. (1396). 'مطالعه بی‌هنجاری گردش‌های جوی همراه شده با فعالیت نوسان مادن-جولین و بارش زمستانه ایران', مجله ژئوفیزیک ایران, 11(1), pp. 49-65. رنجبر سعادت آبادی, عباس, سوری, معصومه. مطالعه بی‌هنجاری گردش‌های جوی همراه شده با فعالیت نوسان مادن-جولین و بارش زمستانه ایران. مجله ژئوفیزیک ایران, 1396; 11(1): 49-65. در این مطالعه بی­هنجاری الگوهای جوی همراه شده با فازهای مختلف شاخص همرفت حاره‌ای (MJO) و بارش رخ داده در هریک از این الگوها بررسی شده است. برای این منظور، از داده‌های روزانه میدان‌های فشار، ارتفاع ژئوپتانسیلی، سمت و سرعت باد از مرکز NCEP/NCAR و داده‌های روزانه بارش 47 ایستگاه همدیدی کشور برای ماه‌های دسامبر، ژانویه و فوریه استفاده شد. بی­هنجاری‌های بارش و الگوهای گردش جوی همراه شده با هریک از فازهای هشت‌گانه MJO مطالعه شد. ﻧﺘﺎﯾﺞ ﻧﺸﺎن داد که بی­هنجاری الگوهای فشاری، مقدار و توزیع بارش کشور در هر یک از فازهای MJO متفاوت است. بیشینه بی‌هنجاری منفی بارش زمستانه کشور، همزمان با فعالیت فازهای چهار و پنج MJO،که هسته همرفت حاره‌ای در بخش شرقی اقیانوس هند قرار دارد، رخ می‌دهد که با بی­هنجاری‌های مثبت ارتفاعی قوی بر روی بخش زیادی از اروپا و نواحی شرقی مدیترانه همراه می‌باشد. میزان کاهش بارش زمستانه همراه شده با این فازها در اکثر مناطق کشور، بین 30 تا 100 درصد است. در فازهای شش و هشت که هسته فعال همرفت در نواحی مرکزی آرام استوایی قرار می‌گیرد و پدیده همرفت در شرق اقیانوس هند سرکوب می‌شود، با بی‌هنجاری منفی قابل ملاحظه ارتفاع در بخش شرقی مدیترانه و اروپا و بی‌هنجاری مثبت بارش زمستانه بر روی ایران، بویژه در نیمه غربی کشور، همراه می‌باشد. در فاز شش بی‌هنجاری مثبت بارش (حدود 30 تا 150 درصد) در بخش عمده نیمه غربی و دامنه‌های جنوبی البرز و در فاز هشت علاوه بر نیمه غربی در بخش‌های شرقی کشور رخ می‌دهد. The Madden-Julian Oscillation (MJO) is the dominant mode of tropical intraseasonal variability, characterized by its planetary spatial scale, 30–60 day period, and eastward propagation. The extra-tropical links with the MJO are well established (Barlow et al., 2005). Such oscillation has an evident seasonality, with larger amplitude during boreal winter and spring than summer (Zhou et al., 2012). MJO can significantly modulate variations in weather and climate in the far-reaching subtropics and midlatitudes (Handerson et al., 2016). In this study, we examined the inﬂuence of the MJO on precipitation and large-scale circulation anomalies based on a 10-years daily data from 2000–2010. We further analyzed the atmospheric circulations, Iran precipitation data and their anomalies with respect to the real-time multivariate (RMM) Index phases of the MJO whose employed index was that developed by Wheeler and Hendon (2004), downloaded from the website of the Australia Meteorological Bureau. The MJO index data used in this research, considering that at least five consecutive days in a phase remained constant and its value was equal or more than 1, was extended from December 2000 to February 2010. Daily precipitation data were obtained from 47 meteorological synoptic stations in Iran from December 2000 to February 2010.Furthermore, the grid point data were extracted from NCEP-NCAR reanalysis dataset. Daily anomalies of precipitation and other variables were calculated by subtracting their 11-year means from the original data. Composites of mean daily anomalies were computed for each of the eight phases of the MJO on the basis of the RMM index with the same MJO phases in boreal winter during 2000-2010. Composites of the regional ﬂow associated with the MJO phases during winter seasons were calculated by averaging fields of data over lists of dates obtained from the analysis of the MJO indices. Figures 2 to 6 display the composites of large-scale atmospheric circulations and precipitation anomalies for the eight MJO phases. It is very clear that winter large-scale atmospheric circulations and precipitation anomalies in Iran show meaningful and significant variations when the MJO propagates from the western Indian Ocean (phase 1) into the central Pacific Ocean (phase 8). As is observed in the figures, winter precipitation in certain parts of Iran is higher than the 1981-2010 climate normals when the MJO is in phase 2, which is close to the mean; positive anomalies weaken over the country as we get closer to phase 3. When the MJO is in phases 4 and 5, precipitation anomalies are less than normal, with the maximum negative anomalies reaching around 100% relative to the mean. During such phases (4 and 5), associated with positive geopotential height anomalies over the eastern Mediterranean Sea, precipitation negative anomalies occur in the country. Winter precipitation in certain regions is much higher than the climate normal when the MJO is in phases 6 and 8. Further observed in these phases were the precipitation positive anomalies over the vast parts of western and southern slopes of the Alborz (from 30 to 150%). So, in these situations which associated with zonal dipole of geopotential heights anomalies over Eurasia where strong negative anomalies of geopotential heights were located over the eastern Mediterranean Sea and its neighborhoods areas, the precipitations over the most part of Iran are more than the climate normals. Extrapolated from the foregoing data is the fact that the MJO inﬂuence on Iran precipitation is signiﬁcant during northern winter season. When the MJO is in phases 6 and 8 (the convection increases over central and eastern Pacific Ocean), more precipitation is observed in the western regions of Iran. On the other hand, as enhanced tropical convection shifts over the Maritime continent, less precipitation is seen over the country. Therefore, owing to the broad tropical and extratropical impacts of the MJO on interaseasonal timescales, a better understanding of the MJO is potentially conducive to the amelioration of the extended range forecast of week-two and beyond, practically when there is an on-going MJO event. Numerical and empirical model experiments have shown the potential predictability of MJO up to 4 weeks. In this study, the objective was to develop composites in order to provide a compendious, large-scale overview of MJO impact on the winter season circulations and precipitation in Iran. عالم­زاده، ش.، احمدی گیوی، ف.، محب‌الحجه، ع. ر.، و نصراصفهانی، م. ع.، 1392، تحلیل دینامیکی–آماری اثر متقابل نوسان اطلس شمالی (NAO) و نوسان مدن- جولیان (MJO): مجله ژئوفیزیک ایران، 7 (4)، 64-80. غضنفری، الف.، 1388، مطالعه موردی توزیع رطوبت و بارش بر روی کشور در زمستان 1386 و ارتباط احتمالی آن با همرفت MJO: پایان نامه کارشناسی ارشد هواشناسی، مؤسسة ژئوفیزیک. قائد امینی اسدآبادی، ح.، و ناظم‌السادات، م. ج.، 1391، ارزیابی نشان پدیده نوسان‌های مادن-جولیان بر رخداد بارش‌های روزانه استان‌های سیستان و بلوچستان و فارس: نشریه آب و خاک، 6، 1372-1383. ناظم‌السادات، م. ج.، رستم‌پور، آ.، و شاهقلیان، ک.، 1395، الگوهای همدیدی در دوران همراه و بدون بارش همزمان با چیرگی فاز 1 پدیده MJO: مطالعه موردی جنوب باختری ایران، مجلة ژئوفیزیک ایران، 10(1)، 73-87. رنجبرسعادت‌آبادی، ع.، و ایزدی، پ.، 1392، ارتباط بی‌هنجاری­های دمای آب سطح اقیانوس هند و دریای عرب با بی­هنجاری­های بارش نیمه جنوبی ایران: مجلة فیزیک زمین و فضا، 39(4)، 157- 135. نصر اصفهانی، م.، 1390، بررسی اثر NAO و MJO بر اقلیم جنوب غرب آسیا: رساله دکتری هواشناسی، مؤسسة ژئوفیزیک، 137- 115. نصر اصفهانی، م.، و احمدی گیوی، ف.، 1389، اﺛﺮ ﻫﻤﺮﻓﺖ اﻗﯿﺎﻧﻮس ﻫﻨﺪ ﺑﺮ ﺑﺮﺧﯽ ﮐﻤﯿﺖ‌ﻫﺎی ﻫﻮاﺷﻨﺎﺧﺘﯽ در ﺟﻨﻮب ﻏﺮب آﺳﯿﺎ: مجموعه مقالاتﭼﻬﺎردﻫﻤﯿﻦ ﮐﻨﻔﺮاﻧﺲ ژﺋﻮﻓﯿﺰﯾﮏ اﯾﺮان، ﻣؤﺳﺴﻪ ژﺋﻮﻓﯿﺰﯾﮏ. Barlow, M., Cullen, H., and Lyon, B., 2002, Drought in central and southwest Asia: La Nina, the warm pool, and Indian Ocean precipitation: Journal of Climate , 15, 697–700. Barlow, M., Wheeler, M., Lyon, B., and Cullen, H., 2005, Modulation of Daily Precipitation over Southwest Asia by the Madden–Julian Oscillation: Monthly Weather Review, 133, 3579-3594. Bond, N. A., and Vecchi, G. A., 2003, The influence of the Madden-Julian oscillation on precipitation in Oregon and Washington: Weather and Forecasting, 18, 600-613. Henderson, S. A., Maloney, E. D., and Barnes, E. A., 2016, The Inﬂuence of the Madden–Julian Oscillation on Northern Hemisphere Winter Blocking: Journal of Climate, 29, 4597–4616. Hendon, H. H., and Salby, M. L., 1994, The life cycle of the Madden-Julian Oscillation: Journal of the Atmospheric Sciences, 51, 2225–2237. Jones, C., 2000, Occurrence of Extreme Precipitation Events in California and Relationships with the Madden–Julian Oscillation: Journal of Climate, 13, 3576–3587. Jones, C., Waliser, D. E., Lau, K. M., and Stern, W., 2004, Global Occurrences of Extreme Precipitation and the Madden–Julian Oscillation: Observations and Predictability: Journal of Climate, 17, 4575–4589. Johnson, N. C., Collins, D. C., Feldstein, S. B., L’HEUREUX, M. L., and Riddle, E. E., 2014, Skillful Wintertime North American Temperature Forecasts out to 4 Weeks Based on the State of ENSO and the MJO: Weather and Forecasting, 13, 23-38. Kalnay, E., and Coauthors, 1996, The NCEP/NCAR 40-Year Reanalysis Project: Bulletin of the American Meteorological Society, 77, 437–471. Lau, K. M., and Wu, H. T., 2010, Characteristics of precipitation, cloud, and latent heating associated with the Madden–Julian oscillation: Journal of Climate, 23, 504–518. Lin, H., Brunet, G., and Derome, J., 2009, An observed connection between the North Atlantic Oscillation and the Madden–Julian oscillation: Journal of Climate, 22, 364–380. Madden R. A., and Julian, P. R., 1971, Detection of a 40–50 day oscillation in the zonal wind in the tropical Pacific: Journal of the Atmospheric Sciences, 28, 702–708. Madden R. A., and Julian, P. R., 1972, Description of global-scale circulation cells in the tropics with a 40–50 day period: Journal of the Atmospheric Sciences, 29, 1109–1123. Madden, R. A., and Julian, P. R., 1994, Observations of the 40–50 day tropical oscillation: A review: Monthly Weather Review, 112, 814–837. Martin, E. R., and Schumacher, C., 2011, Modulation of Caribbean Precipitation by the Madden–Julian Oscillation: Journal of Climate, 24, 813-824. Matthews, A. J., Hoskins, B. J., and Masutani, M., 2004, The global response to tropical heating in the Madden–Julian oscillation during the northern winter: Quarterly Journal of the Royal Meteorological Society, 130, 1991–2011. Riddle E. E., Stoner, M. B., Johnson, N. C., L’Heureux, M. L., Collins, D. C., and Feldstein, S. B., 2013, The impact of the MJO on clusters of wintertime circulation anomalies over the North American region: Climate Dynamics, 40, 1749–1766. Wheeler, M. C., and Hendon, H. H., 2004, An All-Season Real-Time Multivariate MJO Index: Development of an Index for Monitoring and Prediction: Monthly Weather Review, 132, 1917-1932. Xiaolong, J., Chen, L., Ren, F., and Li, C., 2011, Impacts of the MJO on Winter Precipitation and Circulation in China: Advances In Atmospheric Sciences, 28) 3(, 521-533. Zhang, C., and Dong, M., 2004, Seasonality of the Madden-Julian Oscillation: Journal of Climate, 17, 3169–3180. Zhang, C. D., 2005: Madden-Julian oscillation: Reviews of Geophysics, 43, 1-36. Zhang, C., 2013, Madden–Julian Oscillation: Bridging weather and climate: Bulletin of the American Meteorological Society, 9, 1849–1870. Zhou, S., L’Heureux, M., Weaver, S., and Kumar, A., 2012, A composite study of the MJO influence on the surface air temperature and precipitation over the Continental United States: Climate Dynamics, 38, 1459–1471.